This is the real world we're living in. Parents will actually forget to register one of their children after they've completed their registration. On Sign-On Day, Dad will suddenly remember that he had to pick up an extra skirt from the shop while he was down there; right after he's just finalised and paid for his order. We've built some great tools to allow for adjusting debts. If you are actually cancelling a registration or an order, there is a much easier way whereby Majestri does most of the work for you. When viewing either a registration or an order in isolation, you will find the Financial History associated with that component down the bottom of the screen. Look for the handy little link as pictured below. After clicking on the link, a popup will appear. The critical field on this form is the one that asks the type of adjustment. Remember these golden rules to avoid getting confused. If possible, create a song out of them to sing in the shower. 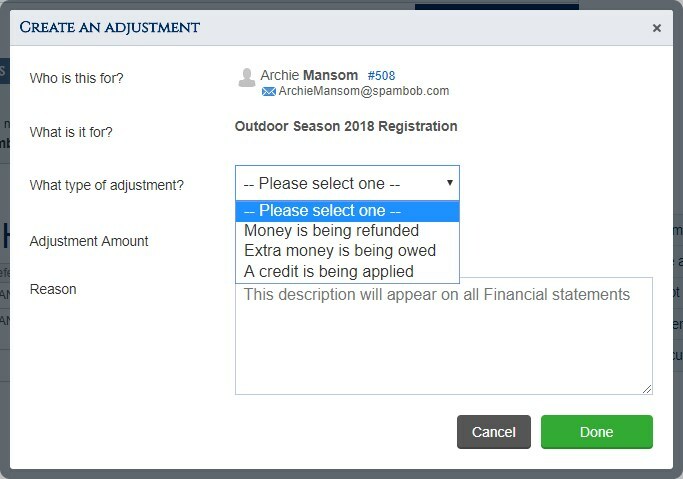 This type of adjustment should be used when you are wanting to increase the amount of money that a member owes the club. Frequent examples for this type of adjustment are when a playing group is changed for a player to one that is more expensive, or extra players are being added to a registration. It can also be used if there are incidental charges that come up post-registration (eg. team charges) or if new items are added to an order after it was submitted. Under the hood, when you create this type of adjustment, Majestri creates a brand new invoice and attaches it to the registration or order - imagine it as an invoice chain. Use this option to reduce the amount of somebody's outstanding debt with the club. A common occurrence that requires this type of adjustment is when a playing group is changed for a player to one that is less expensive. It can also be used to reward contributions by volunteers or over-payments they may have made elsewhere. You essentially want to charge the member less. Credits are a kind of payment instrument without being revenue. They exist purely to lessen somebody's outstanding debt. If money is physically changing hands back to the member, then it is definitely a refund. It's also worth putting good narrations in for all adjustments. This will definitely help auditors and other people that come along after the fact who don't have the context that you have when you create the adjustment. In fact, if you can standardise the narrations used, particularly for credits, then you'll have a far easier time classifying them when used in reports. Adjustments are a core part of being in control of club Financials in Majestri, and we do get some questions about them. Please see our Adjustments FAQ for the most common ones.